It's the rainy season in Missouri so of course we have increased incidence of ants in the home. But this year, for the first time, I am finding these small black ants in my ice-making machine. The machine is located at a wet bar in the family room and is not near to any source of stored or spilled food. It's been there and in operation for 10 years and this is the first time I am finding ants there. I can't figure what draws the ants to the ice machine bay. They seem just to go there, freeze to death and force me to clean out the ice bay every day. Any ideas why they are there and what I can do to keep them out? That is an interesting question. It's hard to say for sure, but they might be going after water, or they just might be attracted to the electricity (we don't really understand why some ants go to areas near electric currents, but it's a pretty well-documented behavior in some species--see especially the Rasberry Crazy ant). To keep them out, you need to isolate your ice machine from the ant nest. If it has legs, and wires connecting it to the floor, you can either make it too slippery for the ants to get up with insect-a-slip , or too sticky for the ants to get up with tangle-foot. Many ants use invisible trails made of tiny droplets of chemicals, which are pheromones that essentially say, "follow me!" If you see ants moving steadily in a line, wiping the surface across which they are traveling with rubbing alcohol and/or detergent will remove this message, and perhaps discourage them from finding it again. In general, the best way to keep ants away from a particular area in your home is to remove anything that might tempt them. This is of course much more straight-forward if the attractant is food--you just have to keep the area clean. But if the attractant is water or electricity, it may be more realistic to use physical barriers like those mentioned above, which can last for a month or more. Killing the ants with a spray will not help very much, because the ants you see that are out gathering food or other resources often represent only 5% of the total colony. It may be possible to poison the entire colony with commercially available ant baits, but not all ants will eat all baits, and not all poisons will be 100% effective. Some of my friends in remote areas were trying to keep ants from biting them at night, and they found that putting the legs of their beds in cans of water worked really well, as did wrapping the legs of their beds with rags soaked in diesel. (Needless to say, the commercially available products would be much safer for indoor use on an electrical appliance.) I even knew a family who built their house on cement stilts, and around the base of each stilt, made a small moat about the width of a finger-tip they could fill with water to keep the ants out permanently. However, the ants still got in by walking along the wires leading into their house! You really have to think of everything to keep the ants away. My name is Roger, and I am 5 and a half years old. We have an ant farm, and we have ants (not fire ants, harvester ants), and we would like to know how to mark them so we know what their names are and what they're doing every day. I like science and experiments and inventing. I would like your help because I really want to remember my ants and remember their names and know what they're doing every day. I thought maybe we should paint them, but I thought that might cover the holes on their body. What kind of paint do we need to use? How great that you are already so excited about biology! Keeping an ant colony is always great fun and we understand that you want to know your ants by names. Marking ants can be difficult. The paint you can use is non-toxic acrylic paint. You can paint very small dots with a very fine wire (for small ants) or a very fine brush (for large ants). You don't need to worry about harming the ants, researchers paint them for some experiments and the ants do well after they have been painted. It is only very difficult because the ants don't like to be painted. To slow them down, you can put the ants in the fridge. This only slows them down for a very short time. But you can also put the ants in the freezer. That slows them down for a longer time, but be careful not to leave them in the freezer too long. Try 2-3 minutes first and see how long they need to recover. If they recover very fast, you can leave them in the freezer a bit longer, maybe 5 minutes. You can also work with them on a cooler pack that is refrigerator temperature (freezer temperatures might harm the ants if you take too long while you're painting them), this will help keep them cool for longer. Some scientists use a special refrigerated table for keeping organisms at a certain temperature while they are working with them. Be careful when you handle them! Feather-weigth forceps (e.g. found here) are best for holding the ants and picking them up. This type of forceps is very soft and does not harm the ants. We also have to warn you not to get stung by the ants. If you really have harvester ants, they have a very painful sting. This sting can have severe effects on you for several hours. Here you can find some great pictures by Alex Wild of ants that have been marked by researchers. 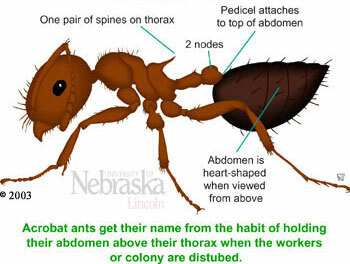 This picture taken by Alex Wild shows some Temnothorax rugatulus ant that have been individually marked by researchers. I'm Lucas and I am 8 years old. I am identifying ants. I have one with 2 petioles, a step depression on the thorax, and a medium-sized spine. It's about 4 or 5mm and a bit hairy. It has short antennae and it's orange-ish brown. In my identification key, it asks if the spine is long or short. If it's long, I think it's an acrobat ant. If it's short, I think it's a seed disperser ant. But the spine on this ant isn't big or small, it's medium, so I don't know what it is. I found it in Cupertino, and it was dead and being carried in the mouth of a bicolored wood ant when I found it. Wow! We're very impressed that you're so interested in ants, and you've done such a great job identifying this one so far! One of the ways I can always recognize an acrobat ant right away is how the second petiole (post-petiole) attaches to the gaster, which is the back part of the ant. Does it attach on the top, like in this picture, or just on the front, like it does on most ants, including seed-dispersers. Also, the petiole (1st petiole) on acrobat ants is flat on the top, whereas the petiole of seed-disperser ants, (and many other ants with a petiole and a post-petiole) has a distinct bump on the top, as show in this great picture by Eli Sarnat. Also, when they're alive, acrobat ants tend to hold their gasters vertically, as shown in this picture by Alex Wild. This is an alarm posture, but, chances are, if a big scary human like you is near by, they will be alarmed! This distinctive posture is also why they are called "acrobat ants:" sometimes they hold their gasters so high, it seems like they are doing a hand-stand! You should check out some pictures of Crematogaster (acrobat ants) and Aphaenogaster (seed-disperser ants) on the Ants of California Antweb page, too. It always helps me to see pictures of the different species in a genus I'm trying to identify, so I have an idea of how much variation there is. I live in Cairns, North Queensland, Australia. I have just found an ant that continually cast off from its location using a strand of web, much like a spider. My partner and I were unable to find any information on such an ant on the web, so were wondering if you could point us in the right direction? Any guidance you could give us would be much appreciated. Thanks so much for your question! It is possible that what appears to the unaided eye to be an ant is actually a spider! Many groups of spiders (and several different types of insects as well) have evolved the appearance of ants, either to fool ants into letting them close enough to eat them, or capitalize on ants' cooperative reputation to intimidate potential predators. The behavior you described sounds like a spider in the 'jumping spider' family, the Salticidae. They will often jump, and leave a 'dragline' of silk as a way of ensuring they have a place to retreat to if they end up jumping too far, or over a cliff that was higher than they thought. I have found that these mimics often switch between moving in a very convincingly ant-like fashion, and reverting back to their jumping spider style of movement. The largest and most diverse group of ant mimics is the jumping spider genus Myrmarachne, with more than 200 species. The center of diversity for this group seems to be in Southeast Asia, although several species also occur in Australia. Several other genera of spiders also mimic ants, though, both jumping spiders and otherwise. Here are some pictures of one of the most common genera of ant-mimicing Salticids in Southeast Asia and Northern Australia (pictures taken in Malaysia). Jesse Czekanski-Moir & the AntAsk Team.